We're committed to keeping you comfortable year 'round. Here's Dayton Heating & Air Conditioning news you can use. Ductless Mini Split AC Systems are convenient and effective for cooling the interiors of many residential, commercial and community buildings today. Whether you are considering installing a mini split in a single family home or a number of mini split ac systems in multi-unit housing, a large apartment or condo complex, business offices or a community performance center, ductless mini splits may be an ideal choice. You’ve felt those chilly mornings. So has your thermostat. Chilly mornings will soon become frosty nights. 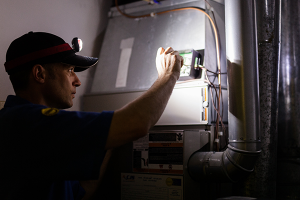 Before you put your furnace to the test, a little preventative maintenance can save you a lot of expensive headaches—as well as chilly days and nights. Why get Furnace Maintenance Before You Need It? 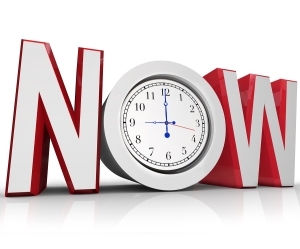 Here are five common sense reasons to schedule a CJS Furnace Safety Check and Tuneup. Because your furnace has the summer off, dust and residue may have built up inside. It’s time to get it cleaned out properly and ready to roll for the winter. Our clean, screened, trained and timely CJS Techs will clean out the system and take apart key components to inspect them for damage. They’ll also change your furnace filter and re-ignite your pilot light if you shut it off over the summer. It’s not going to be long before the thermometer starts living in single digits making a functioning furnace more than an issue for comfort in your home, but safety as well. The time is now to identify any potential problems with your system when you’ve got control over your schedule and when the weather is pleasant enough. You don’t want to have a disaster strike in the middle of the night in January. You do everything you can to keep your family safe, right? In that case, you definitely need to schedule a furnace tune-up on your to-do list. Carbon monoxide is tasteless and odorless, which makes it hard to detect. To protect against deadly carbon monoxide poisoning, have a detector installed. Also have routine furnace inspections, where your CJS tech cleans your system and looks for leaks where carbon monoxide can escape into your home. Would you rather pay a little to fix a small problem or a lot to fix a big problem? It’s a no-brainer. However, without one of our clean, screened, trained and timely CJS techs to do the work, you won’t be able to uncover potential problems until they become more expensive to fix. Getting your furnace serviced means that it is running clean and smooth. This translates into improved air quality for your family. Furnace maintenance is particularly important if you or one of your family members has asthma or allergies, or if you have a pet releasing dander in the air. Why wait till your house is an icebox? 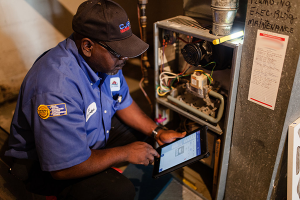 Scheduling your CJS Furnace Safety Check and Tuneup today will give you peace of mind, knowing you’ll be warm and cozy during the season ahead. Give CJS Heating & Air, in Dayton, OH at (937) 488-4758 to get scheduled. As winter months approach, many of us Dayton homeowners struggle to find creative new ways to save on utility bills. The time to take action is now before cool snaps turn into frosty, cold nights. Taking these few simple, energy-saving steps helps conserve energy and make this winter more comfortable and affordable. Depending on how much your Dayton home has already, applying home insulation can help lower energy bills. Placing extra insulation around windows and covering the gaps between the base of an exterior door and the floor with convenient “weather strips” helps prevent waste. One of the simplest ways to save on utility bills is scheduling regular preventative maintenance for your furnace and air conditioning system. One of our clean, screened, trained, and timely CJS techs can inspect your air conditioning and furnace to make certain that this equipment remains in safe, efficient working condition. For example, we clean dirt and debris from your combustion chamber which helps your furnace operate more efficiently, ultimately contributing to more energy savings. Another smart way to lower energy bills is to purchase energy-efficient appliances. Refrigerators, ovens, and other household appliances and fixtures today frequently carry the Energy Star label. This system helps you understand how much energy these units require. Over time, purchasing Energy Star energy-efficient products results in significant savings. Installing ceiling fans throughout your home increases comfort without keeping the thermostat as low in the summer or as high in winter months. Ceiling fans help cool everyone in a room effectively, working in conjunction with central air and central heat. Mechanical systems all break down at some point. If your Dayton home heating and cooling system frequently malfunctions, or uses outdated, obsolete technology, upgrading to a state-of-the-art heating and cooling system will help reduce your utility bills. During earlier decades, many manufacturers did not appreciate the importance of conserving energy. Today, most modern heating and cooling systems emphasize energy saving features. Taking a little time to explore ways to lower utility bills remains a very wise investment. Savvy property owners today understand the importance of conserving energy. You rely on your furnace to keep you warm during the long, cold Dayton winters. But if your heating system is blowing cold air, then there are three common reasons such as thermostat problems, overheated furnace or the pilot light is out. As summer nears, air conditioning repair and replacement is on many homeowners minds. Are you planning to replace your broken air conditioner in Dayton, OH? If so, then read on to learn what factors to consider before purchasing a new AC unit. Were you less than happy with the performance of your last air conditioner? If so, then you may benefit from taking advantage of this opportunity and considering other options. Speak with one of our clean, screened, trained, and timely CJS technicians about your AC unit options and which varieties make the most sense for your home and needs. Many people underestimate the significance that proper sizing can have on the overall performance of an air conditioning unit. 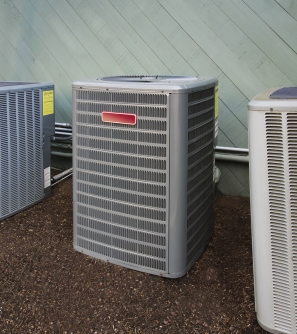 When sized correctly, your AC has the potential to reach its maximum efficiency and may enjoy a long lifespan. An improperly sized air conditioner, on the other hand, might require more frequent repairs and wear down faster than one that is the right size for your home and household. Also, air conditioners that are not the ideal size may have reduced efficiency that leads to higher utility bills. Finally, AC units that are too small may fail to cool your home as much as you would like, and those that are too large may run too frequently and leave your indoor air too humid. An AC unit’s SEER rating is its seasonal energy-efficiency ratio and the higher the number, the more energy-efficiency the air conditioner. Speak with your HVAC technician about minimum SEER ratings for your area and which ratings may be best for you. The thermostats that are available today can potentially provide you with lower utility bills and better convenience. How old is your thermostat? If you’re not sure and if it isn’t programmable, then now could be the perfect time to upgrade this part of your air conditioning system. A programmable thermostat gives you better control over your home’s heating and cooling, and some varieties can even be controlled remotely using a cellphone and other devices. Are you facing a broken furnace or air conditioning unit in Dayton, OH and need repairs right away? If so, then look no further than CJS Heating & Air. 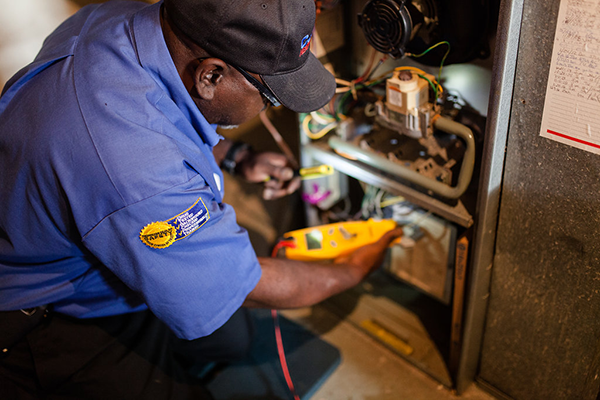 Our clean, screened, trained, and timely techs offer excellent service and air conditioning repairs. When you have an emergency, don’t hesitate to call. A heating or cooling breakdown that occurs during extreme weather should be addressed as soon as possible to help ensure your family’s comfort and health. Also, refrigerant leaks, gas issues, and electrical problems can be hazardous if handled by someone who is inexperienced, so these repairs should be left to professionals. Finally, any AC issue that causes water leaks or flooding should be fixed immediately to help prevent water damage and mold. CJS Heating & Air offers 24/7 emergency services for no additional cost. There’s never any added charges if your scheduled appointment runs past business hours, or if you require emergency service after-hours or on the weekend. We know cooling and heating emergencies can occur at any time, so we take quick action to provide our customers with emergency service for air conditioning and heating breakdowns. The summer season is about to arrive, and now is the time to tackle air conditioning and furnace problems that could be affecting the performance of your HVAC system. Before the start of the summer months, you should be sure to clean out your furnace filters. With services from a company that offers furnace repair near Dayton, you can make sure that your air conditioning and HVAC systems are clean and ready for seasonal use. To help you maintain your system between professional services, let’s take a look at three easy ways to clean inside your air conditioner. 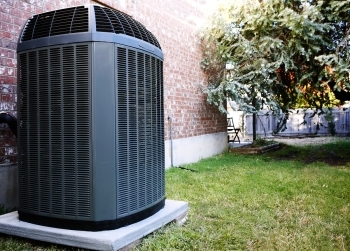 Your air conditioner condenser unit is a large, square shaped appliance that is located on the exterior of your home. During the winter months, the exterior covers of the condenser can get covered with dirt, grime, and other types of debris. To restore the clean appearance of your condenser unit and improve its overall performance, you should take the time to routinely remove and wipe down its cover using a soft cloth. Many of today’s air conditioners are equipped with reusable filters, which can be washed and reused many times. After you have taken off the exterior covers from the air conditioning condenser unit, you will be ready to remove and wash its air filter. To safely wash your air filter, it is possible to simply dunk it in a bucket of warm, soapy water. Once the filter has completely dried, it can be put back into place. Using your household vacuum, you can help your air conditioner achieve the deepest level of clean. Once you have placed the hose attachment to your vacuum, you will be able to easily vacuum out your air conditioner’s condenser coils and other interior spaces. The vacuum will remove leaves, grass clippings, and other types of debris that could be clogging up your system and affecting its performance.